A number of reviewers have complimented Anna Olswanger’s award-winning children’s book Shlemiel Crooks for the music of its Yiddish-inflected language. Now, Shlemiel Crooks and a number of Olswanger’s other stories will actually be set to music, as a new Shlemiel Crooks musical comes to the stage. Shlemiel Crooks: The Musical, directed by Wendy Gross Baker, premieres April 10 at the Merkin Concert Hall in New York, featuring the hall’s professional Poppy Seed Players troupe. Olswanger recently wrote about the origins of Shlemiel Crooks on the JewishGen blog. In her essay “Genealogy: The Gift of Stories,” Olswanger writes about how a desire to hear again the stories of her late father lead her to genealogical research. A Yiddish newspaper article about bumbling crooks trying to steal her great-grandfather’s Passover wine became the basis for Shlemiel Crooks, which received rejections from over one-hundred publishers before being accepted by NewSouth, and going on become a Sydney Taylor Honor Book, a Koret International Jewish Book Award Finalist, and a PJ Library Book, along with a musical and puppet show. Read Anna Olswanger’s “Genealogy” essay and Toby Bird’s review at the JewishGen blog. You can learn more about Shlemiel Crooks: The Musical from the Merkin Concert Hall, or connect with Anna Olswanger at www.olswanger.com. Anyone who reads Shlemiel Crooks, the award-winning illustrated children’s book by NewSouth author Anna Olswanger, will hear the music in it. In the lilting rhythms of its charming Yiddish-inflected prose, you might even hear the author paying homage to her dad. Berl Olswanger was a genial and talented blues man who created and played music in and around Memphis, Tennessee, for most of his life. A child prodigy (he started playing the piano at age three), he was a prolific composer, band leader, recording artist, and music store owner. In fact, he was so identified with his work that he became popularly known as “Mr. Music.” Now, in loving tribute to her father, Anna has created an elegantly realized website which showcases his work and, via audio links, allows the viewer to hear a few of his recordings. They are very special. For more on Berl Olswanger, read Vance Lauderdale’s story from Memphis Magazine. And in a fitting related development, a musical loosely based on Anna’s own Shlemiel Crooks has been written by Sean Hartley and Bob Kolsby and scored by Scott Ethier and Clay Zambo. The new work was given a successful first reading at NYC’s Kaufman Center last month. Host-a-Jewish-Book-Author.com is a free web source of information on Jewish-themed books worldwide. The Center for Jewish Culture and Creativity undertakes projects that address Jewish identity and Jewish community through the medium of arts and culture. 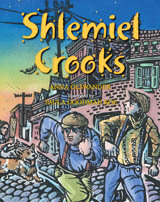 Many reviewers have commented on the musicality and great read-aloud character of Shlemiel Crooks. A new audio clip from the book lets you hear the text for the first time. You can find the link on NewSouth’s website and also at shlemielcrooks.com. Download the audio clip of Shlemiel Crooks and listen in! Shlemiel Crooks is available from NewSouth Books, Amazon.com, or your favorite retail or online book seller. Anna Olswanger, author of Shlemiel Crooks, spoke as part of a panel discussion on February 21 with the Women’s National Book Association, New York Chapter. In a discussion titled Into the Future: Trends in Children’s Publishing, the panelists–including librarians, editors, and others–considered not only the current trends in children’s books, but also how those trends can be good or bad for the industry. Anna, who also works as an agent for Liza Dawson Associates, noted that she often eschews trends in favor of good writing. She worried that a trend toward emphasizing a book’s visual impact over the words on the page may cause children to be less engaged overall with the books they read. A full report of the panel was provided by Kate Lindsay in the WNBA newsletter. Learn more about the WNBA at their website, www.wnba-books.org. Shlemiel Crooks is available directly from NewSouth Books, Amazon.com, or your favorite local or online book retailer. Shlemiel Crooks is a Koret International Jewish Book Award Finalist and a Sydney Taylor Honor Book. Need a Jewish book author for your upcoming event? Check out Host-a-Jewish-Book-Author.com, a new independent list site created by Anna Olswanger, author of Shlemiel Crooks. The site, searchable by name, location, or genre, makes it possible for those who wish to arrange visits and signings with Jewish book authors to quickly find and connect with these authors worldwide. All authors listed on the site have agreed to participate and have provided their contact information, book titles, lecture topics, and areas of travel, and each listing contains links for purchasing the books mentioned. This site should prove invaluable for Jewish Community Centers, Federations, synagogues, book clubs, libraries, bookstores or any other group hoping to host a Jewish book author. Anna Olswanger, author of the NewSouth book Shlemiel Crooks announces the Ninth Annual Jewish Children’s Book Writers’ Conference, held at the 92nd Street Y in Manhattan on Sunday, November 18, 2007, from 9:00 am to 5:00 p.m. The conference is co-sponsored by the 92nd Street Y Buttenwieser Library and the Jewish Book Council. Featured speakers are senior editor Reka Simonsen of Henry Holt Books for Young Readers, editor Jennifer Wingertzahn of Clarion Books, senior editor Lindsey Silken of JVibe/JFL Media, sales manager Sarah Aronson of Jewish Lights Publishing, literary agent Kirsten Wolf of Jill Grinberg Literary Management, and associate art director Einav Aviram of Simon & Schuster Books for Young Readers. The registration form is available for download at www.92y.org/content/pdf/jewishchildrensbookwriters.pdf. Call 212-415 5544 or e-mail library@92Y.org for additional information or to request the form by mail. The final registration deadline is November 12. The conference is $85 before November 1 and $100 after November 1, and the fee includes kosher breakfast and lunch. If you write or illustrate children’s books for the Jewish market, this conference is for you! Shlemiel Crooks author Anna Olswanger has been interviewed by the online book review program Just One More Book. Just One More Book is podcast devoted to literacy and children���s books. During the interview, Anna detailed the development of her career as an author and literary agent and gave hints to aspiring writers from the perspective of both a writer and an agent. Listen to the full broadcast of the interview at Just One More Book. 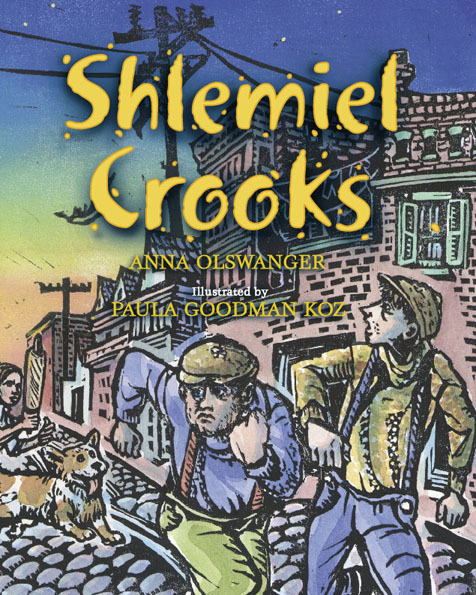 Shlemiel Crooks, written by Anna Olswanger and illustrated by Paula Goodman Koz, is available from NewSouth Books, Amazon.com, or your favorite online or local book retailers. You are currently browsing the archives for the Shlemiel Crooks category.